A service delivered to the UK higher and further education community in association with Jisc, bringing more than 100,000 videos, images, and sound recordings to your screen. Welcome to MediaPlus from Alexander Street, a ProQuest Company. You have been redirected here from the former Jisc MediaHub subscription service, which was retired on 31 August 2016. 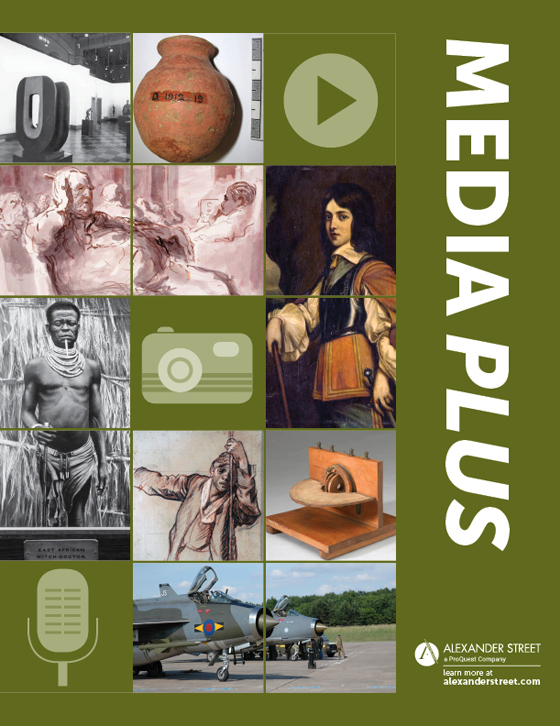 MediaPlus is now hosted and delivered to existing and new subscribers by Alexander Street, the leading provider of academic streaming media. All Jisc-licensed news, film, image and music content including high profile collections such as ITN, Getty images and Wellcome Library images and sound are available. The collection is now complete. Visit the collection. All resources are cross-searchable with other multimedia resources via http://search.alexanderstreet.com, with enhanced user-engagement metrics to learn more about how resources are being used. Also available for free for higher and further education is Teacher's TV, a collection of 3,800 concise instructional videos featuring engaging and practical in-classroom demonstrations and commentary from teachers, administrators and other educational experts. The contact point for all enquiries for the new service is mediaplus@alexanderstreet.com. Please note that MediaPlus is available only for higher and further education institutions in the United Kingdom.